Payment Instructions: 10% onsite buyers premium on hammer price for items selling for $20,000.00 or less. 5% onsite buyers premium will be charged on items selling for 20,001.00 and above. Additional 2% buyer's premium for all online purchases. 3% service charge for all payments made with credit cards. Your credit card will be authorized at registration with a hold of $1,000.00 by our card processor. Please note the hold amount may be held on your card up to 10 days after the auction. Release of the hold is dependent on your financial institutions policy. Checkout Date & Times: ALL ITEMS MUST BE REMOVED FROM AUCTION SITE NO LATER THAN, SATURDAY, JUNE 29, 2019 AT 4:00 PM. NO SUNDAY LOAD OUT. ALL ITEMS LEFT OVER NIGHT WILL BE FULL RESPONSIBILITY OF BUYER. Payments: Payment is due in full on auction day on all purchases. Purchases can be paid with cash, credit card, cashier's check, company check. ALL company must have a current bank guarantee letter made to Joey Martin Auctioneers, LLC guaranteeing payment. Wiring Instructions 1.Bank Routing Number: 053100300 2.Bank Name: First Citizens Bank 1508 E. Greenville Street Anderson, SC 29621 3.Beneficiary Account Name: Joey Martin Auctioneers LLC (Escrow Acct) 4.Beneficiary Account Number: 009160310893 5.Swift Code for international wires FCBTUS33 State Sales Tax: 7% GA sales tax applies to all items purchased, unless a resale certificate is on file with Joey Martin Auctioneers, LLC. Warranty: ALL ITEMS ARE SOLD AS IS, WHERE IS, WITH NO WARRANTIES OR GUARANTEES. NO REFUNDS WILL BE ISSUED. ALL SALES ARE FINAL. Credit Card Terms: We accept Visa, Master Card, Discover, & American Express. An additional 3% charge for credit card payment will be added to invoice. All credit card sales are final, no refunds on credit card payments. Additional Terms: An additional $50.00 fee will be added to all titled items sold. Also, Ad Valorem Tax will be applied to titled items for Georgia Residents where applicable. Occasionally an item must be removed from the auction due to circumstances beyond our control. If there is an item that you are interested in, please call ahead of time to ensure that it is registered into the auction. ALL ITEMS MUST BE REMOVED FROM AUCTION SITE NO LATER THAN, SATURDAY, JUNE 29, 2019 AT 4:00 PM. NO SUNDAY LOAD OUT. ALL ITEMS LEFT OVER NIGHT WILL BE FULL RESPONSIBILITY OF BUYER. LIEHBERR 622 CRAWLER LOADER, ENCLOSED CAB, TOOTH BUCKET. S/N 392-2240. 4807 HOURS. 2005 F650 XL SERVICE TRUCK VIN 3FRWX65PX5V144316. 244,974 MILES. 6 SPEED MANUAL TRANSMISSION. CAT DIESEL ENGINE. MICHELIN 11R22.5 RUBBER. CHAMPION AIR COMPRESSOR, IMT 6025 CRANE. 2008 F750 XLT SERVICE TRUCK, VIN: 3FRWX75V68V640674. AUTO TRANSMISSION, CAT DIESEL ENGINE. 173,511 MILES. POWER WINDOWS, LOCKS. MILLER BLUE STAR 6000 AIR COMPRESSOR, S/N LC542310. CRANE, AUX FUEL TANK. KW W900 TANDEM AXLE CRANE TRUCK, VIN: 157312S. IMT 18000 SERIES CRANE. EATON FULLER 10 SPEED TRANSMISSION. MICHELIN 11R 24.5 RUBBER. 52,097 MILES. 2009 FORD E-350 SUPER DUTY SERVICE VAN. AUTO TRANSMISSION, 5.4 GAS ENGINE. VIN 1FDSE35L59DA69752. CAT C6500 FORKLIFT, SN: AT83F50093, MAX CAPACITY 6500LBS, MAX FORK HEIGHT 185", TRUCK WEIGHT 10,640LBS. 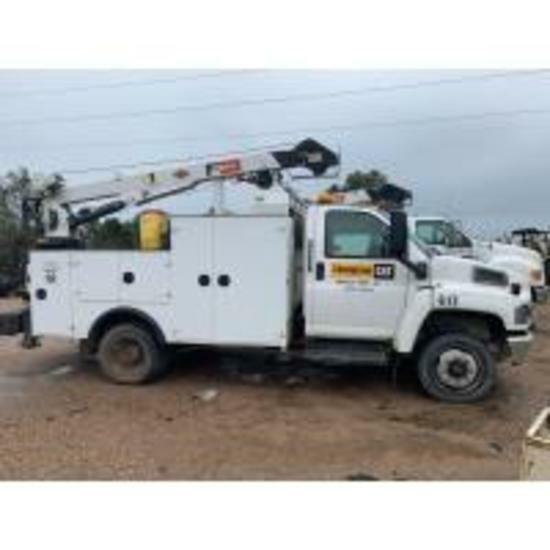 2005 F650 SERVICE TRUCK, VIN:3FRWX65P05V116931. 6 SPEED MANUAL TRANSMISSION, CAT DIESEL ENGINE. 273,523 MILES. IMT 6025 CRANE. MICHELIN 275/80/R22.5 RUBBER. YANMAR AIR COMPRESSOR. 2008 F350 SERVICE/MECHANICS TRUCK, AUTO TRANS., 6.4 POWER STROKE DIESEL ENGINE. VIN: 1FDWX36R28EC00546.